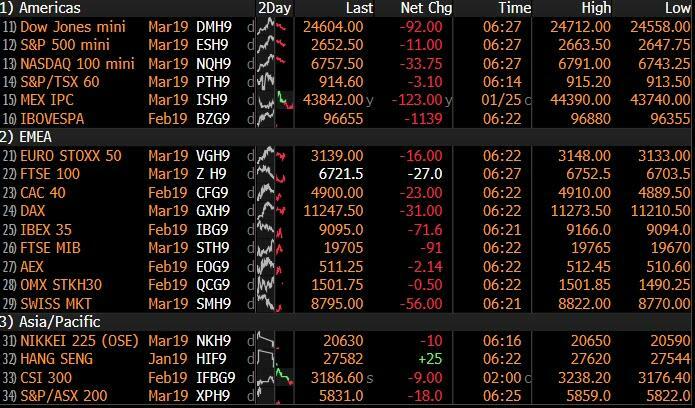 It's a sea of red in global equity markets as Friday's euphoria fizzled after President Donald Trump made clear he won’t take no for an answer in his effort to construct a border wall while investors are hunkering down ahead of an action-packed week which includes the UK Parliament's Brexit "Plan B" vote, a Fed meeting, a new round of US-China trade talks, the deadline for the Huawei CFO extradition notice, a potential Venezuela showdown, January US payrolls report and the busiest week of earnings season. While stocks jumped on Friday after Trump "caved" and agreed to reopen the government, the party moody was dented after Trump tweeted "Does anybody really think I won’t build the WALL?” late on Sunday as the committee of lawmakers crafting a plan for the southern U.S. border is expected to start meeting this week. On Sunday, Trump told the WSJ he'll get the funding even if he has to use emergency powers while Trump's acting chief of staff said he's prepared to shutter the government again or declare an emergency if needed to get the wall money. The dollar was flat as were 10Y TSY yields, while iron ore prices soared following a deadly dam collapse at a mine in Brazil which killed at least 58 people in a huge blow to Brazil mining giant Vale, the world’s biggest producer iron ore, which announced overnight it would suspend its dividend as it shores up liquidity ahead of what could be a crushing legal penalty. Asian markets started off the week mixed, as bourses in Shanghai, Hong Kong, Tokyo and Seoul all losing ground: Japanese shares retreated along Chinese peers due to trade tensions, while stocks in Hong Kong pared gains to close little changed. 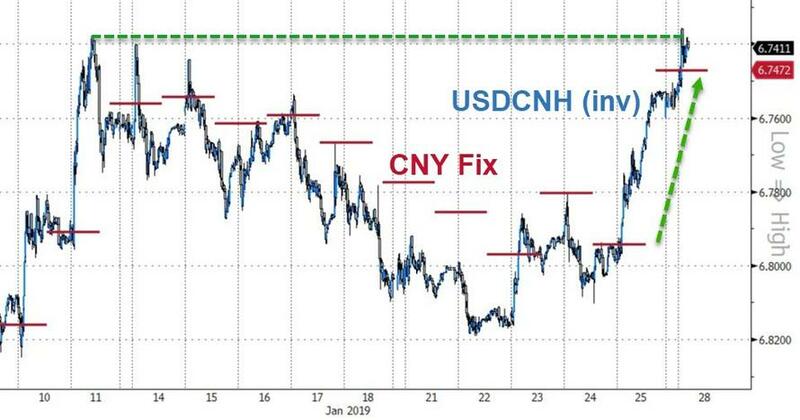 The yuan appreciated to its strongest against the dollar since July, the CNH rising some 400 pips tracking the weaker dollar, before Vice Premier Liu He’s trip to Washington for trade talks, and as the People’s Bank of China freed up a potential $37 billion for bank lending and a new chief was named to lead the country’s main securities regulator. 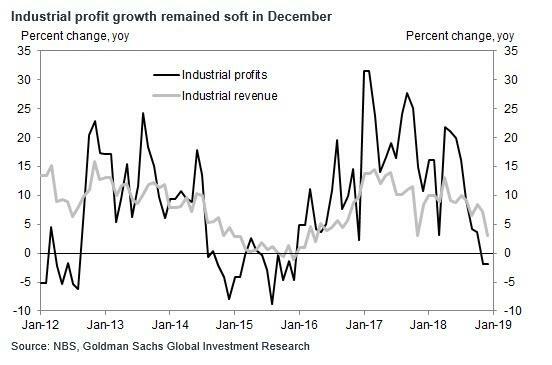 Overnight concerns about China's slowing economy re-emerged after earnings at China’s industrial firms shrank for the second straight month, suggesting trouble ahead for manufacturers struggling with falling orders, job layoffs and factory closures amid a protracted trade war with the United States. Investors are now waiting for Chinese Vice Premier Liu He’s visit to the United States on Jan. 30-31, for the next round of trade negotiations with Washington. But with the sides still far from resolving trade issues, the dollar stood firm as traders sought a safe haven as they await news from U.S.-China talks on Tuesday and Wednesday. The MSCI world equity index, which tracks shares in 47 countries, fell 0.1 percent, while MSCI’s main European Index dropped 0.5 percent. The broader Euro STOXX 600 index also fell 0.5%, failing to rebound from a slide at the open after two days of gains, with most sectors falling except miners which followed the rising price of iron ore. West Texas oil fell below $53 a barrel after America’s rig count rose for the first time this year. In addition to Trump's border wall crusade, traders will focus on negotiations between the US and China which are set to resume in a very busy week which also include: Fed chair Jerome Powell will host a press briefing after the U.S. central bank’s policy decision, some of the biggest technology companies including Apple, Microsoft, Facebook are reporting Q4 results, and there will be another series of potentially key votes in the U.K. Parliament about Brexit. To cap it all, a flurry of American economic figures including GDP and jobs data are also set for release. Elsewhere, Bitcoin fell again, putting the biggest cryptocurrency on track for its lowest close since December. Emerging-market stocks edged lower while their currencies climbed. Gold retreated. Russia’s MOEX stock index touched an intraday record high after sanctions were lifted on Rusal, before reversing gains to trade lower as oil prices slumped. The dollar index, a gauge of its value versus six major peers, was flat at 95.801 as the dollar recovered following the Tokyo fix and Treasuries gained as global stocks started the week on a defensive note. "In this environment the dollar was holding up well,” said Thu Lan Nguyen, a forex strategist at Commerzbank. “I assume that this will continue to be the case, even as the conflict intensifies at the end of the week." The dollar will also get a strong steer from this week’s Fed meeting, where the central bank is expected to signal a pause in its tightening cycle and to acknowledge growing risks to the world’s biggest economy. Though the Fed has forecast two more interest rate hikes for 2019, a darkening global economic outlook and highly volatile stock markets have clouded the policy picture. Elsewhere in currencies, sterling drifted lower as investors consolidated positions ahead of crucial votes in the British parliament designed aim to break the Brexit deadlock. The British currency edged down a quarter of a percent lower to $1.3164. Lawmakers earlier this month rejected Prime Minister Theresa May’s EU withdrawal agreement, which included a nearly two-year transition period to help minimize economic disruption. That defeat set up a series of votes on Tuesday through which lawmakers and the government will try to find a way forward. Emerging-market currencies rose to the strongest level since June before the rally lost steam, while oil prices consolidated. In commodities, Brent crude futures were down 1.8 percent, at $61.01 a barrel. Oil prices fell amid signals that crude output may rise further, and worries grew over the signs of economic slowdown in China, the world’s second-largest oil user. Gold was slightly down. Spot gold was down 0.2 percent at $1,300.56 per ounce, hovering just below a more than 7-month high of $1,304.40 reached earlier in the session.